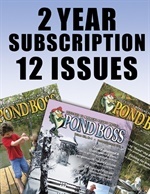 The Pond Boss Store is your go to source for everything "Pond Boss". From subscription options to our library of back issue, books, videos and gear, you'll find the store brimming with pond management "know how". Best of all, we make it easy with a variety of payment options (Visa, MasterCard, and Discover ) and FREE SHIPPING (within the 48 contiguous United States). Browse and enjoy! NOW OFFERING- Auto Renewals for your subscriptions! 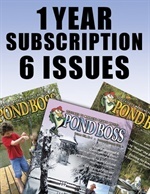 To enroll, call 800-687-6075 or email renewals@pondboss.com for details.